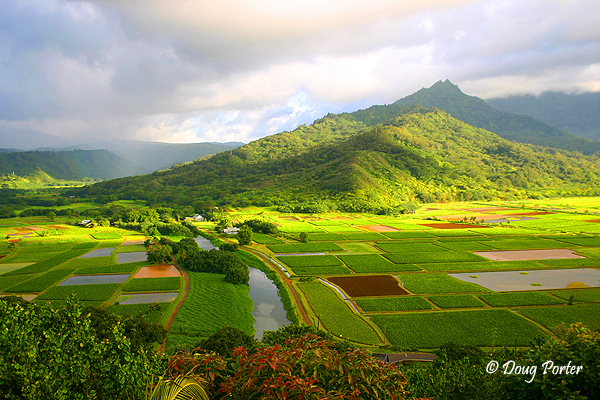 The Hanalei Valley has been an important agricultural site for as long as people have populated Kauai. Polynesians introduced taro to the islands when they first arrived between 300 and 800 AD. After more than 1000 years of growing taro, production in the Hanalei Valley shifted to rice in the 1800s. The Hanalei Pier was first built in 1892 to support a then thriving rice industry. Production shifted back to taro some time after world war II. 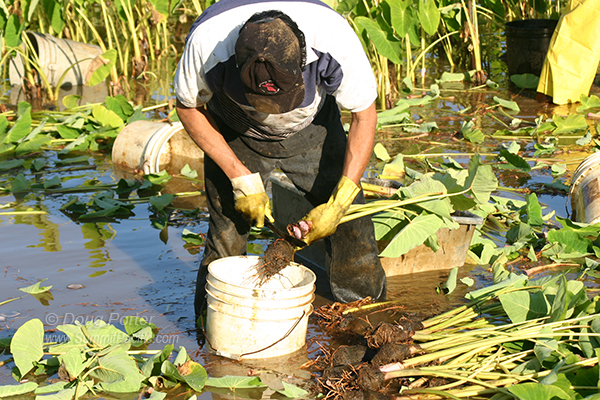 Today, taro is again the principal crop and is grown year round along the river. The Hanalei Valley is comprised of many agricultural parcels, each divided into many paddy fields farmed by growers like the Koga family. The Kogas have many paddy fields or patches maturing at different times. 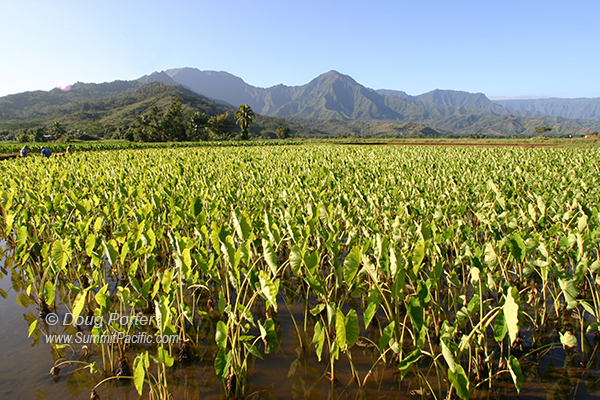 Because it takes six months for a crop to mature, each taro patch yields two crops a year. Planting is staggered so that a new crop matures and is harvested every week. For the Kogas, the first few days of the week are spent harvesting every plant in a patch by hand. The root is cut from the stalks, bagged, and hauled out of the fields in sacks. The stalks of the plant are saved with a small part of the root top until later in the week to be hand planted again in the same patch. Re-planted, the stalks grow into new plants. Through staggered planting, a new patch is ready for harvest and re-planting each week. The different stages of production and plant maturity produce the variations of color in the patchwork seen from above. When the Kogas aren't harvesting and planting, the rest of the week is spent weeding and tending the fields. They take Sundays off to attend church in Hanalei. The Kogas are of Japanese decent and devout Mormons. Taro can be grown in flooded paddy fields or on irrigated dry land although flooded cultivation produces greater yields. Flooding also helps with weed control. 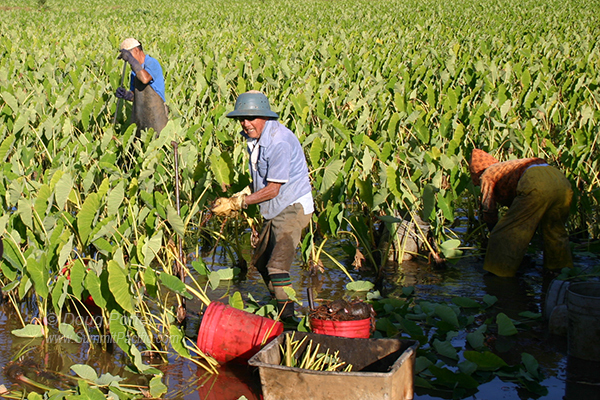 Along with rice, taro is one of the few crops that can be cultivated in flooded conditions. Fields are kept underwater year round and are only drained to harvest and replant. George Koga lived his entire life on Kauai. When I mentioned that it was remarkable he could still work so hard at his age, he quickly pointed out that he had slowed down some. George passed away in 2008 - two months shy of his 89th birthday. Next to the Hanalei River and with average rainfall of over 60 inches a year, conditions are ideal for taro. 73% of the State of Hawaii's taro production is grown on the island of Kauai and most of it is grown here on the north shore. 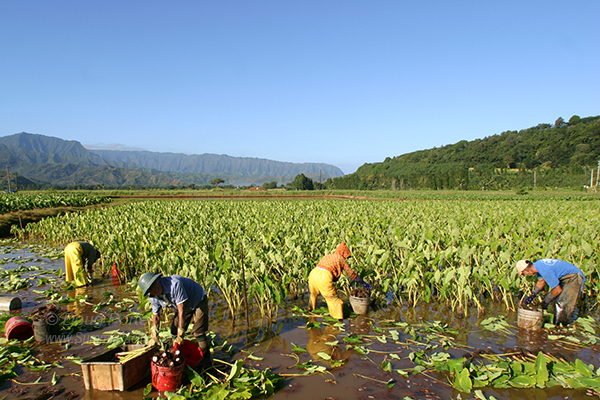 With about 235 acre in production, Kauai produced 3,300 pounds of taro in 2006 valued at about $1.82 million. Taro corm is also becoming popular when sliced, deep fried and sold as chips. This is one way in which taro's appeal is expanding into new markets. Because taro was the main staple of the ancient Hawaiian people and helped them to survive, it has a cultural and even religious significance to them. Taro is so aligned with the Hawaiian people, that the word "Ohana" (meaning family), is derived from the word oha, the shoot that grows from the taro corm. "Haloa" (Taro) is the name of the first-born son of the parents who begat the human race. Fighting, using harsh words and arguing is not allowed when a bowl of poi is on the table. The corm, or underground part of the stem, is cooked and mashed into a smooth starchy food called poi. Like any other starchy food (mashed potatoes come to mind) poi has a rather bland taste if eaten plain. Poi looks a little like sticky purple pudding and seems a little like eating paste. Somehow the Hawaiians love it. Next time I'm at a luau, I'm going to try it with salt. Taro's steamed leaves (lu`au) and flowers (pua) are generally used in dishes with meats, fish, coconut milk, and other vegetables. The taro fields along the river are also an important habitat for many endangered species of birds and ducks; including the Hawaiian Stilt. Its long legs are perfect for wading and hunting insects in the flooded taro fields. 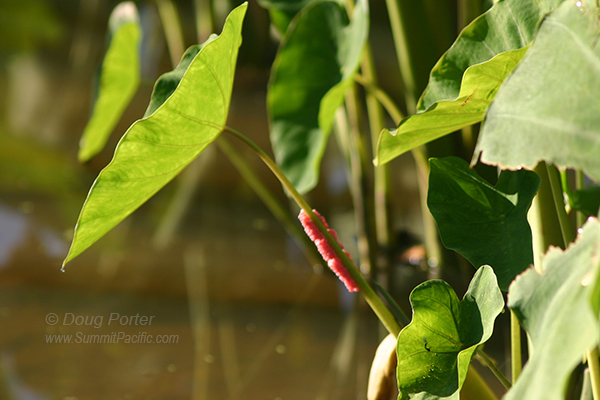 Taro production on Kauai is hampered somewhat by a recent invasion of Apple Snails which eat the plants and lay their pink eggs on the stalks. Besides reducing yields, another consequence of this pest is that farmers are no longer able to work barefoot in the paddies because underwater snail shells are sharp.